What’s it about? The War of Unification ravaged the land for many years, with the secret weapon of the winning side being “Fairy Soldiers”—individuals who became hosts for fairies and thus gained the ability to summon them in battle. As a child, Marlya’s village was burned and she was separated from her childhood friend Veronica, and joined the mafia in hopes of finding her again as an adult. Her gamble pays off, but Veronica insists she’s a completely different person now. Meanwhile, Marlya winds up entangled with Dorothea, an organization made to track down illegal fairy users after the war’s end. I don’t know if you can tell from the length of the summary up there, but this is One of Those: a high-concept action fantasy anime that shovels a buttload of basic worldbuilding into the first episode alongside some really pretty action scenes, leaving the audience to kind of guess how the show will shake out once it’s not 70% exposition. In this case, I’m leaning toward “maybe pretty good.” The obvious point in its favor is that it comes from P.A. Works, a studio known for gorgeous visuals, and this premiere is no slouch. While the fight choreography between the human characters is a little lackluster, Veronica’s technique of dispatching mooks by cutting their arms so that her fairy can zoom into their blood and explode them from the inside is pretty ghoulishly delightful. I may have clapped. On the other hand, this isn’t a flying-gibbets-of-gore grimdark affair, so while there’s a fair amount of blood and low-key body horror, it isn’t likely to turn stomachs for the average viewer. 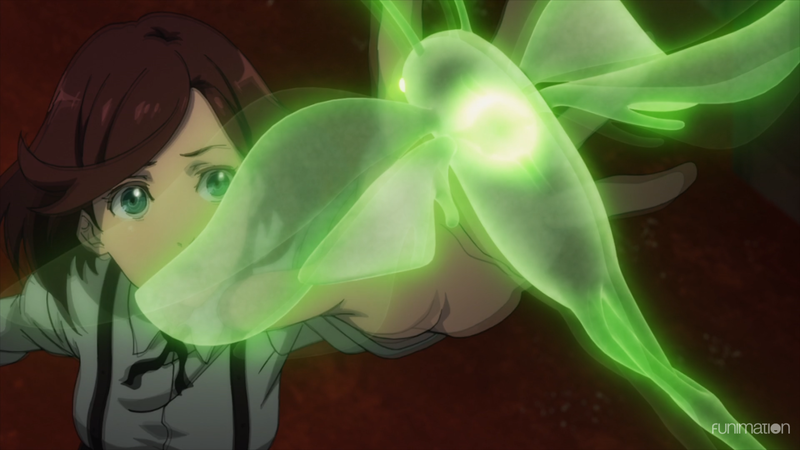 The fairies themselves are rendered in CG, which gives them an otherworldly feel in shots where they’re zipping in and out of frame but already looks a little bit silly during protracted fights, which may come back to bite the show later. There’s also an awful lot of dark, murky colors in the color palette, but the pops of bright green and red give me hope that things will vary up if/when the cast gets out of the Victorian-flavored city. While the exposition tosses out tons of names, the background can be boiled down pretty simply to other premises you’ve heard before: there was a war, and there were enhanced soldiers who fought in it who are now at loose ends in peace time, and there is a dangerous substance from that war that people are still getting hold of for personal gain. For me at least, that stuff makes up the smallest draw of these high-concept shows. What keeps me coming back is a good set of characters, and there’s a lot of potential here for that. Marlya is a really endearing lead, fresh-faced and curious but also competent enough that she doesn’t immediately need to be bailed out by her male co-lead, former Fairy Soldier Free (his name is Free Underbarr, y’all, I can’t). Her relationship with Veronica is clearly the main hook on which the series plans to turn, and while “childhood friend is on the wrong side, MUST RESCUE” is a super common trope in shows with male leads, it’s done less frequently in series starring women. And honestly? I’m all about it. The fact that Veronica still obviously cares about Marlya but seems too ashamed to be near her keeps it from falling into the question of “why are you bothering with this person.” Free also seems to have his own long-lost blond comrade to chase after, if the show’s prologue and opening are any indication. Marlya and Free have a nice friendly back-and-forth established here. While part of me dreads the show will take it in a romantic direction (no thanks! Not least because he was a grown soldier when she was like eight! ), I am completely down to watch them travel around bouncing off one another and solving supernatural crimes. While there’s still a lot of factors up in the air about the show’s overall narrative goals, there’s a wealth of material to work from here. It looks good, it has two fantastic female leads that the camera doesn’t sexualize at all, and it’s snappily paced enough to keep from getting bogged down in the usual expository issues. It’s kind of a tragedy that this one is barred behind Funimation’s incredibly broken proprietary streaming service (though you can also get it on Hulu if you’re in the U.S.), but hopefully folks will still be able to track it down and give it a try.